With a soft sound the speed roller door opens and reveals a brand new greenhouse. We're entering the third phase of Boem Berry Farms. The 5 hectare expansion was completed this year, and the first strawberries were harvested from this greenhouse on November 1st. With this latest addition, Boem Berry Farms is now completed. Being 15 hectares in total, it is the biggest strawberry greenhouse in North America. 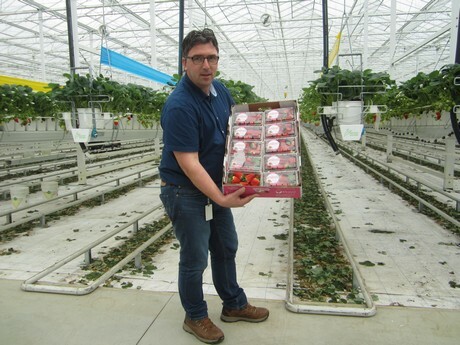 It has been three years since Bert Mucci, Joost van Oers and Ton Bastiaansen joined forces to grow strawberries under glass in Canada. The 4,000 m2 trial area showed good results, and in May 2016 ground was broken for the first 5 hectares. "Getting where we are now took effort and it took time", says Joost van Oers, while standing in the currently finished, 15 hectare project. "And let's be honest - a headache and some sleepless nights are part of the deal too. No guts, no glory." Finding buyers was one of the first steps taken by the growers. Ton Bastiaansen explains how greenhouse grown strawberries are new to the North American market. "Californian strawberries are common here and have been since forever. Locally grown strawberries are something completely new. We needed to get attention for this product, needed to market it carefully." They connected with Bert Mucci of Mucci Marketing Company, a familiar name in marketing greenhouse-grown vegetables. The decision to join forces wasn't a hard one. "We could never have done this by ourselves", Ton explains. "Bert has put an amazing amount of effort in it and brought us where we are today." Construction of phase 1 started in 2016, and the first strawberries were harvested in September of the same year. The building process, outsourced to a local greenhouse builder, went quickly. "We aimed for the best", Joost says. "We've chosen diffuse glass and work in a 7.5 meter high greenhouse. 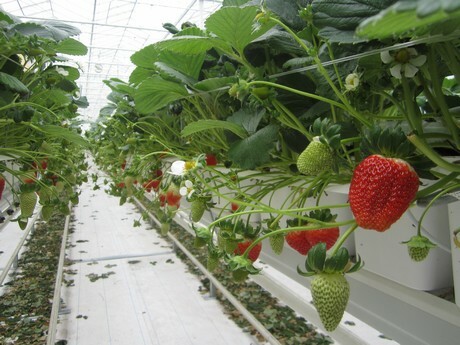 It's equipped with everything needed to cultivate strawberries successfully: a high pressure fog system, a modified pipe rail system, a grow pipe and a cultivation system specially designed for the crop." The paths are 140 meters long and there's 8 of them per 8 meter trellis. Every department is provided with a washing area and bathrooms, saving walking time continuously. Half of the year, a part of the greenhouse is being used as a nursery. These 2.5 hectares, 1/6th of the total acreage, are equipped with a cultivation system that can be lifted. This makes it possible to use it for several purposes: during the rest of the year, it's part of the normal greenhouse. "The height of the gutter can be adjusted", Joost confirms. Ton adds, "Working with various heights is ideal in strawberry cultivation. For the mother stock we put the gutters at a medium distance: 2.30 meter. The same space can be used afterwards for growing the young plants." Achieving the maximum result with a minimum of labor and an optimum use of space obviously is an important topic for the company. Therefore a new propagation system and propagation trays were designed. 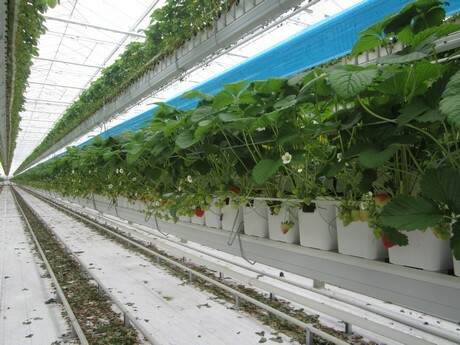 In the design, re-using the drain water of both the propagation trays and the cultivation gutters is taken into account - respecting the strict Canadian environmental regulations. "The system was designed with Meteor Systems and we would never have been able to do it without their input and knowledge", Ton shares. "The complete production unit can be copied and used at any location in the world, making it possible to combine propagation and production at the same location." The Boem Berry Farms strawberries are marketed as strawberries grown completely without chemical crop protection. "Strawberry was a new crop to the suppliers of biological crop protection", Joost says - another threshold taken by the entrepreneurs. The 2016 launch of the BBF strawberries was an immediate success. "We won the hearts of the consumers easily and were preferred over the Californian product. The taste is exquisite, as well as the shelf life. However, we've learned quite a few things as well", Joost says. "For example, we were growing two varieties that could not keep up with our quality standards, and therefore were unable to sell quite a large amount of our first 5 hectare crop. That's what happens when you start something new, and especially when you enter a new market." With the project being completed, what's next? "Nothing for this year", they reveal. "Well, nothing... no building. This year we are focusing on our crop. Building puts a heavy burden on the organization." Without it, there's the possibility to grow even further - something that might sound like a contradiction. "But our product remains a novelty and it takes a lot of attention to get the product and the story at the consumer in the right way." 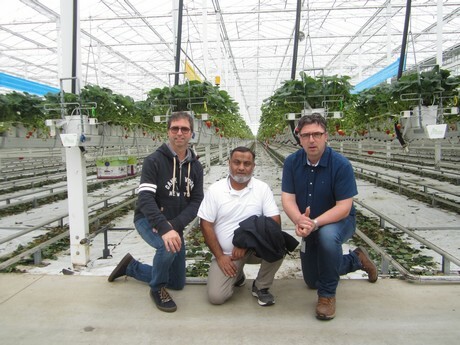 Where before a Canadian grower was in place, this year Sjef Smits (general manager) joined the company, supported by Nasif Mahmood. "These two are doing the best they can to make a success out of BBF, and especially the communication with the Netherlands has improved", they explain. "Working with 8 different nationalities requires a lot of attention, after all", Sjef Smits laughs. But of course there's more to explore. Let's talk about cultivation strawberries year round, by using artificial lighting. "Some barriers are taken, and some new challenges arrive", the three entrepreneurs conclude.